Daniela Ryf und Timothy O’Donnell gewannen den Ironman 70.3 Gdyna mit jeweils großem Vorsprung. Ryf verbesserte dabei die 70.3-Weltbestzeit auf 3:57:54 Stunden. She is simply unstoppable. Daniela Ryf (SUI) put on another historic performance at Enea IRONMAN 70.3 Gdynia, Poland, winning the women’s race with a new IRONMAN 70.3 world record of 3:57:54. Timothy O’Donnell (USA) finished first in the whole competition, recording 3:47:40. 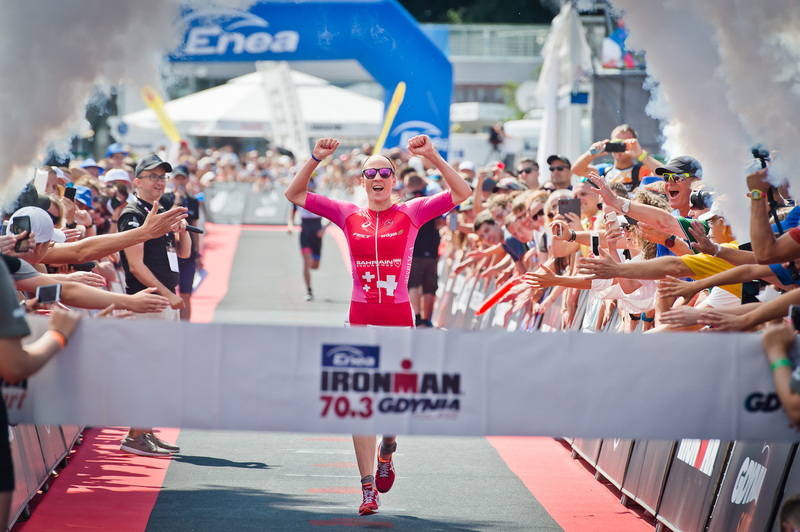 Women’s race in Gdynia was said to be a battle of two IRONMAN legends – Mirinda ‘Rinny’ Carfrae (AUS) and Daniela Ryf. Although, they both won IRONMAN World Championships three times, Ryf has been dominating the past three years while Carfrae is just getting back to the competition after giving birth to her first child. The Aussie looked pretty strong and put on a great performance finishing second in 4:20:46, but it was by far not enough to challenge Ryf, who was on fire from gun to tape, making it look easy to set a new female world record (3:57:54) at an IRONMAN 70.3 event. Worth mentioning, she finished 7th overall. Local Ewa Komander completed the podium in 4:25:40, taking the national champion title too. – I am very happy. The course was perfect for me. Also, the rain was helpful on the run and these crowds supporting us on the streets of Gdynia. I could hear the finish line crowd well before I entered the finish chute. This gave me additional wings – said Daniela Ryf. – It was a great event, perfect organization. The team standing behind Enea IRONMAN 70.3 Gdynia really know their job. And the crowd support was amazing – said three-time IRONMAN World Champion. A historic performance by Daniela Ryf should not overshadow what was going on in the men’s field. Timothy O’Donnell took the lead early in the water and was first to get on the bike, followed by 2015 Enea IRONMAN 70.3 Gdynia champion, Nils Frommhold (GER). They both controlled each other on the one-loop, 90k hilly bike course leading through the picturesque Kashubia region and returned to the city of Gdynia to conquer the running course split by only a few seconds. However, it was O’Donnell who was able to build a 1-minute lead over the first 5km on the run and then continued to expand the lead on the loud and crowdy streets of the city. He was already 5 minutes ahead of Frommhold when he crossed the finish line on the city beach in Gdynia after 3:47:40, cheered by thousands of fans gathered in the finish area. It’s also the best time ever at Enea IRONMAN 70.3 Gdynia. – I really enjoyed the race and its great atmosphere. Also, the course and the weather were perfect, even despite some rain on the run – said Timothy O’Donnell. Frommhold finished second in 3:52:57, fighting off an attack from his compatriot, Markus Liebelt who finished just 30 seconds behind. Enea IRONMAN 70.3 Gdynia took place on August 5, 2018. More than 2250 athletes registered while nearly 1950 entered the competition. Athletes swam in the Baltic Sea, then took on a challenging, one-loop bike course leading through the Kashubia region in order to come back to town for the running stage, held on three loops in the city center and along the sea boulevards, finishing on the main city beach. Dieser Eintrag wurde veröffentlicht in Veranstaltungen und verschlagwortet mit Bildergalerie, Gdynia, Ironman 70.3 von Klaus Arendt. Permanenter Link zum Eintrag.